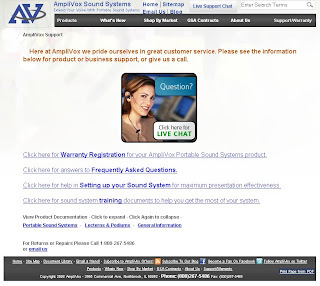 AmpliVox is proud to announce that we now provide live chat customer support. If you go to our homepage and click on "Live Support Chat" we will connect you to live customer chat support. We realize that it may not always be convenient to make a phone call or wait for an email to solve a problem. That is why we have expanded our customer service to include live chat so that we can provide a quicker, more convenient solution to meet your needs. You can access Live Chat by going to our Support Page or accessing it from our homepage. Communication is a foundational element of business. Managers and bosses need to communicate effectively what their goals are and how their employees are to achieve those goals. Companies spend millions on meetings and training because they know they are a vital part to everyday business success. But did you know that the environment in which the meeting or presentation takes place can be a hindrance to effective communication? 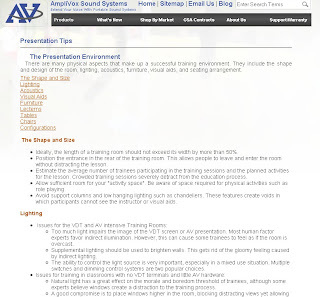 AmpliVox's Presentation Tips, which provide guidance and options for optimizing every aspect of your presentation space and ensure you have the optimal setting to communicate important ideas. AmpliVox covers everything from the shape of a room, rules for using visual aids, to the type of furniture that is ideal for your situation. Click here to see the complete list of presentation tips. 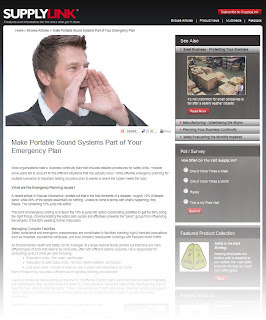 Watch our video about how to choose the right size PA system. Earlier this month, the Lincolnshire Review featured AmpliVox in an article about our Pink Podium Promise Promise, where AmpliVox donates pink podiumd to breast cancer awareness related presentations and events. This program hit the ground running in December and has since donated a dozen Pink Podiums all over the country. Anything can be colored pink and used to raise breast cancer awareness. The proof is in Northbrook. That's the location of the warehouse where Lincolnshire-based AmpliVox Sound Systems keeps its most attention-grabbing products: pink podiums. AmpliVox builds and ships pink podiums, for free, to organizations around the country that organize breast cancer awareness activities. "I thought in some way we could contribute something," said Don Roth, AmpliVox's owner. "A series of events have led me to conclude that we can have an impact." To read more about how Amplivox gives back, click here. 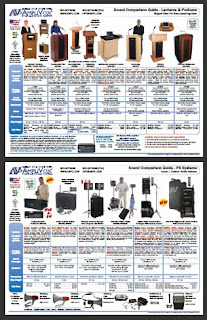 Our Sound Comparison Guide provides a great overview of our most popular products and categories. 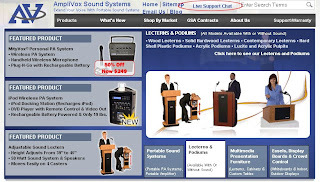 Page one contains details on many of the lecterns that AmpliVox offers and the second page has our PA Systems. The SW505A Adjustable Column Lectern has two built-in speakers, two convenient storage areas, and adjusts from 39-45 inches high. This model is pictured on the right. The SW915 Digital Audio Travel Partner is a lightweight wireless portable speaker system has a USB connection, expansion slots, a rechargeable battery, wireless mics, and other options including a remote control. The speaker and tripod from this package are pictured on the right. 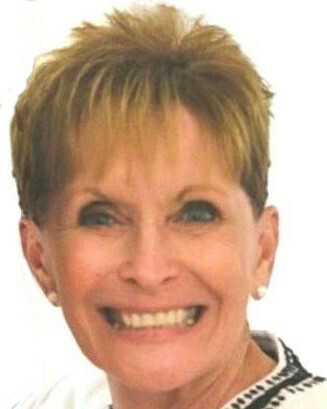 Read a blog entry about how it was featured in a magazine's Top Ten list! Recently AmpliVox has taken steps to make sure that we are not leaving a big carbon footprint. Our lecterns are Forest Friendly (no new trees cut! ), made from 100% recovered/recycled wood, in tune with CARB requirements, built using local sources, and helping to mitigate climate change. Click here for more environmental information about some of the green measures we have put into place to positively affect our environmental impact. AmpliVox launches the breakthrough iPod Portable Sound System. Amplivox Sound Systems introduces the innovative iPod remote controlled Wireless PA System. This brand new PA System features an exclusive iPod docking station and a remote controlled DVD player with video out. Northbrook, Illinois (Amplivox Sound Systems) February 2, 2010 – AmpliVox Sound Systems is proud to introduce a breakthrough PA system made for the multimedia presentations of today’s speakers: the iPod Remote Controlled Wireless PA System. This innovative system includes an iPod docking recharging station and DVD player with video-out. This easy to use iPod PA System, which is compatible with iPhone™ and most iPod® models, delivers sound and video for multimedia venues providing presenters with “personal” choice. It provides clear sound for audiences of up to 500 in a 2,500 square foot room with its 30 watt amplifier and 8” full-range speaker. The design also includes a voice priority switch that mutes the music while the microphone is in use. 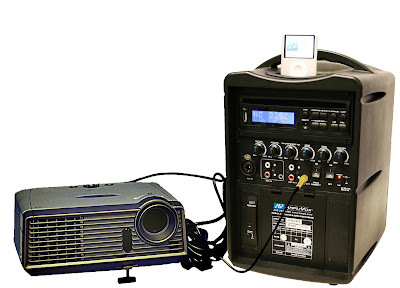 “The ever-growing popularity of the iPod has created a wide demand for this wireless PA system. We’ve designed this iPod PA specifically for the way our market listens to music and watches videos to give them a full choice of multimedia selection when they’re presenting”, says AmpliVox CEO Don Roth. AmpliVox ® Sound Systems products are made in the USA (with only a few exceptions), meet stringent UL standards, and come with an up to 6-year warranty. Our wide selection meets every speaker's sound coverage and style needs. Whether you are in a small meeting room of 30 people or a large 20,000 square foot auditorium of up to 10,000 people, AmpliVox ® Sound Systems' extensive range of superior quality, simple to operate and reliable electronics will provide maximum satisfaction and ensure a crystal clear message.